How we doubled our client’s organic traffic and increased search engine traffic by over 640% in one year! Client Bio: Maibach’s Home Furnishings is Northeast Ohio’s finest home furnishings store with over 20,000 sq feet of tastefully displayed furniture showroom featuring the latest collections and freshest looks from some of the top names in the furniture industry. We have worked with Maibachs for many years and then we were given the opportunity to help them with their internet marketing strategy. Traffic to the website was minimal at best and the traffic that they were getting was a result of people searching for their name or simply coming to the site directly. There was virtually no organic traffic from the search engines. Goals: To increase organic search traffic from the search engines. Ideally traffic would come from terms that are general in nature, relevant to Northeast Ohio and do not contain the name Maibachs. Ultimately we realized that to grow the website traffic we would have to get Maibach’s to show up for searches that did not contain their company name. Ultimately we needed them to show up for general searches related to furniture in the Northeast Ohio area and we planned to do this through ongoing content marketing, among several other services. This would result in customers learning about the store and ideally coming there to shop, whereas before they would have had no idea that Maibach’s even existed. An additional element to the campaign would be to stay top-of-mind with their existing customer base using and growing their email marketing list through sign-ups on the website. We believe that once you make contact with a customer on your website or in your store you should find ways to stay in-touch. Email marketing is the perfect avenue. 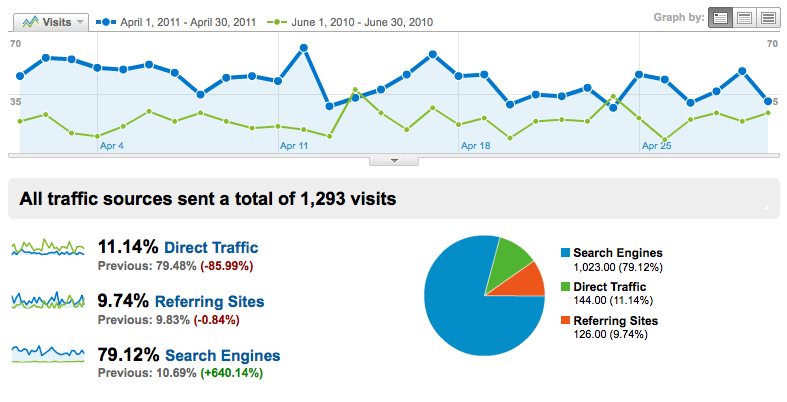 The results below show the traffic and traffic sources for maibachs.com when we started the campaign. As you can see, the majority of the traffic coming to the site was direct (which means they simply typed in maibachs.com). Traffic from search engines was low and mostly a result of people searching for the name Maibachs. Maibachs has realized now that an ongoing investment in internet marketing is essential so we are still working with them today. But for our purposes here we’ve shown the improvements over 12 months. (See traffic comparison below) As you can see, the results have been great. Direct traffic to the website is down relevant to the organic search engine traffic. We always want direct traffic but our goal here was to increase traffic from the search engines and we succeeded with an overall 12 month increase of over 640% – therefore almost doubling the monthly traffic that they get to their site on a monthly basis.